They're called "atmospheric rivers" and they can dump massive quantities of Pacific Ocean water on California, carrying it through the air from as far away as Hawaii. 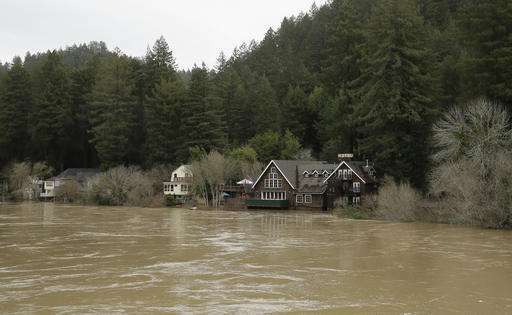 Here's a look at the weather phenomenon that has swelled the state's rivers, flooded vineyards, dumped snow and rain on the Sierra Nevada and raised the risk of mudslides on hills scorched by last summer's wildfires. Atmospheric rivers are long and narrow bands of water vapor that form over an ocean and flow through the sky. They occur globally but are especially significant on the West Coast of the United States, where they create 30 percent to 50 percent of annual precipitation and are linked to water supply and problems such as flooding and mudslides, according to the National Oceanic and Atmospheric Administration. Formed by winds associated with cyclones, atmospheric rivers typically range from 250 miles to 375 miles in width and move beneath the influencing effects of other weather. 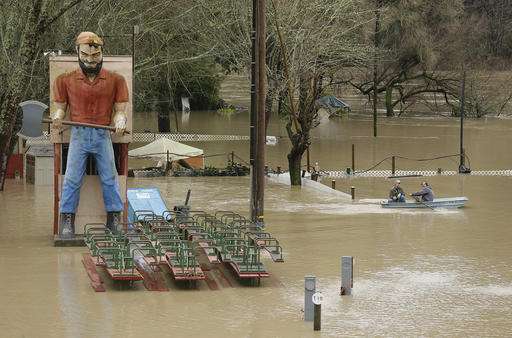 Last weekend's atmospheric river that sent rains pummeling California through Monday interacted with a low pressure system pushed by a cold jet stream from the northern Pacific, said Bill Patzert, a climatologist at NASA's Jet Propulsion Laboratory. "They come at you like a fire hose," said Patzert. 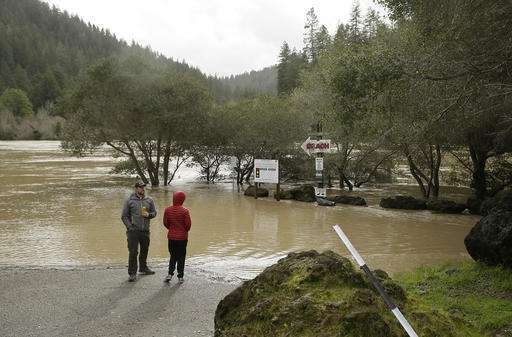 The atmospheric river that hit the state this time first targeted Northern California and then moved south and down the coast to Southern California. Most atmospheric river events are weak. But the powerful ones can transport an amount of water vapor equal to 15 times the average flow of water that flows out of the Mississippi River's mouth, according to NOAA's Earth System Research Laboratory. WHAT HAPPENS WHEN AN ATMOSPHERIC RIVER REACHES LAND? When the moisture-laden air moves over mountain ranges like the Sierra Nevada along the California-Nevada border, the water vapor rises and cools, becoming heavy precipitation that falls as rain or snow, according to NOAA. While traditional cold winter storms out of the north Pacific build Sierra snowpack vital to the state's water supply, Patzert said atmospheric rivers tend to be warm. That causes the snow at the highest elevations but rain usually falls on the snowpack at lower elevations. 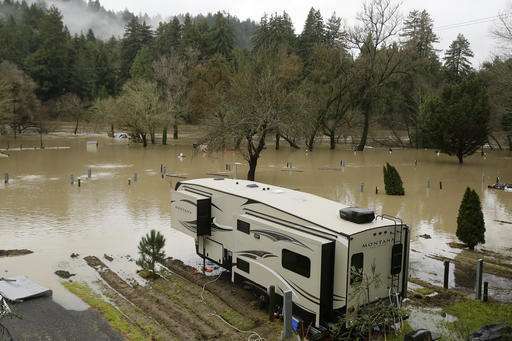 That can quickly prompt melting, runoff and flooding and decrease the snowpack needed to supply California with water. It is a nickname for an atmospheric river that originates near Hawaii. WHERE DID THE TERM ATMOSPHERIC RIVER COME FROM? The name came from research published in the 1990s by scientists Yong Zhu and Reginald E. Newell of the Massachusetts Institute of Technology. 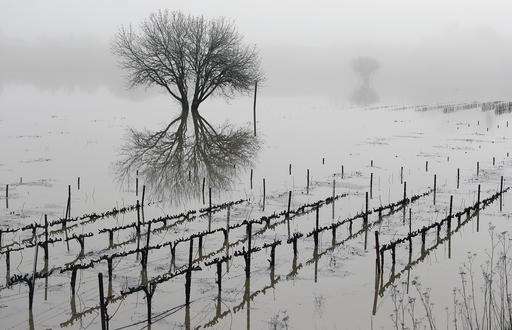 After five years of withering drought, California has had a wet fall and early winter. About 18 percent of the state is now free of drought, according to the U.S. Drought Monitor used to gauge drought conditions across the U.S. and allocate drought relief. The improvement came despite the presence of the weather phenomenon known as La Nina, a cooling of waters in the central and eastern Pacific that is sometimes linked to unusually dry conditions. This La Nina has been so weak that Patzert calls it "La Nada." The lack of a La Nina influence and the disappearance of high pressure ridges over the West Coast that kept storms away in recent years has opened the door to atmospheric rivers. "Some of these warm storms have actually decreased the snowpack," said Patzert. "Looking ahead to the spring, summer and fall, all this rain might seem sweet at this point but an awful lot of this is running out through the river systems."